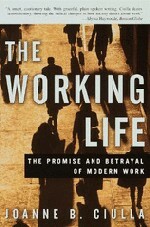 "The problem with the promise of work is that people can expect more than their work can deliver." Joanne B. Ciulla is Professor and Coston Family Chair in Leadership and Ethics at the Jepson School of Leadership Studies, University of Richmond where she is one of the founding faculty. She is also a Visiting Professor at Nyenrode Business Universiteit in the Netherlands and Fort Hare University in South Africa. Ciulla has held the UNESCO Chair in Leadership Studies at the United Nations International Leadership Academy in Jordan, and had academic appointments at Harvard Business School and The Wharton School. She teaches, writes, and consults on leadership ethics, business ethics, and the philosophy of work. Ciulla has a B.A., M.A., and Ph.D. in philosophy. In 2003, she won the Outstanding Faculty Award from the Virginia State Council of Higher Education and in 2007 she received The Distinguished Educator Award from the University of Richmond. In addition to her book, The Working Life, The Promise and Betrayal of Modern Work, Ciulla has published five other books, including a three-volume set called Leadership at the Crossroads. She sits on the editorial boards of The Business Ethics Quarterly, Leadership, and is an Associate editor of The Leadership Quarterly. Ciulla is the president of The Society for Business. She has moderated and taught seminars at the Aspen Institute, The World Economic Forum, The Brookings Institution, and a number of other business and government organizations in the U.S. and abroad.